The citizens of Bumblyburg are no longer showing compassion! They are committing outrageous crimes, giving in to peer-pressure, and the weather is unusually stormy. Something is definitely amiss in the city of Bumblyburg, but who's behind these evil doings? ;None other than, the evil genius, Plum Loco! He's created a device called the Brain-Twister, and Larryboy is out to stop him. When a tornado rages through town the citizens of Bumblyburg wind up on the receiving end of their own teasing. But how will Larryboy calm this storm and show everyone the importance of being kind? ;Sunday morning values, Saturday morning fun. Now that's the Big Idea! Through imaginative and innovative products, Zonderkidz is feeding young souls. 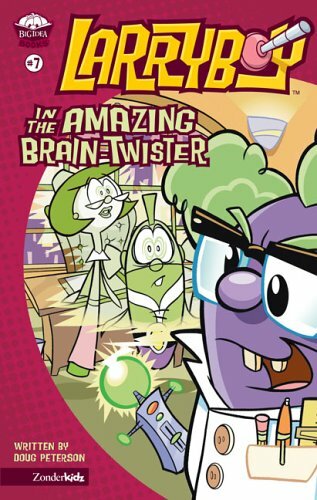 LarryBoy in the Amazing Brain-Twister by Doug Peterson was published by Zondervan in November 2003 and is our 17046th best seller. The ISBN for LarryBoy in the Amazing Brain-Twister is 9780310706519. My brother & I really liked this book and I think any child would like it. Got a question? No problem! Just click here to ask us about LarryBoy in the Amazing Brain-Twister.